Act Of Defiance is a metal band, hailing all the way from California. Act Of Defiance follows in the footsteps of fellow American thrash metal bands such as Nevermore, Metal Allegiance and Testament. 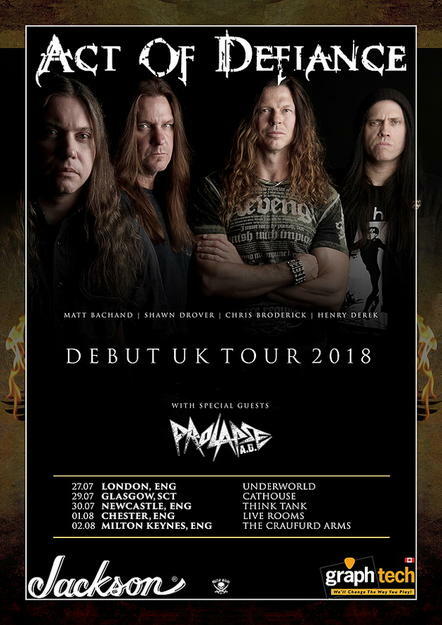 In 2014 Act Of Defiance rose like a phoenix from the ashes of Megadeth, after guitarist Chris Broderick and drummer Shawn Drover quit the band. Although they’ve only been performing since 2015, they’ve already cemented their place in the halls of metal. I was excited to witness Act Of Defiance’s first ever European tour, celebrating their newly released album “Old Scars, New Wounds”. Their epic follow up album to their 2015 hit “Birth and the Burial”. This was one definitely one of my favourite gig reviews to date, growing up listening to his music in Megadeth, I have always admired and been insanely jealous of his legendary guitar skills. Being able to meet and actually talk to him, on top of finally seeing his guitar work close-up was an incredible experience I won’t forget, and one of my best birthday presents! You always worry that famous musicians from world renown supergroups would be, justifiably, arrogant. But he was open and friendly, it was just like chatting to a mate down the pub. They say don’t meet your heroes, but I was not disappointed. And you could tell by crowd’s reaction, that they were all as excited as me to see them play their first gig of their first ever European tour! The dance floor was packed despite the heat and humidity. And when he stepped out onto that stage, there were shouts and cries, and many fists raised into the air, reaching desperately up toward them. One of the most unique and captivating elements to their songs, is the constantly varying pitch and tone, keeping the listener on their toes. The mix of high powered, high energy thrash metal contrasts, yet also compliments, the slow and melodic elements. There are elements of slow and dramatic power ballads mixed in with the heavy and fast paced instrumentals. This mix of genres spreads throughout their new album, “The Talisman” gives the it a new twist, bringing in different tempos and themes.